I have some exciting news to share on this Good Friday! I'll be sharing more about each of these separate projects this month. 2) And, shut the front door, my royal indigo entry door with frosted glass is being featured on Remodelaholic this evening! I'm so excited to share how possible making your own personally designed door can be, even from scraps. 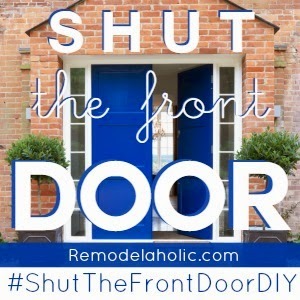 :) Please be sure to check out all the other amazing door projects and hacks featured on the site this week, too. Want to keep track of Sunnyside Up-stairs? Aw, Joanne! Thank you for commenting. I've missed you and have thought about you quite a bit lately! I hope you're well. So glad you still love that door. Thank you for being such a fantastic friend and one of my greatest encouragers!